Incorrect, no red card as there was cover, but the 'tackle' alone deserved a red, as he was off the ground, didn't get anywhere near the ball, knew he wouldn't win the tackle, and it was shin high and off the ground - look at the tackle Luis was sent off for which was tamer in my opinion given he was front side on. 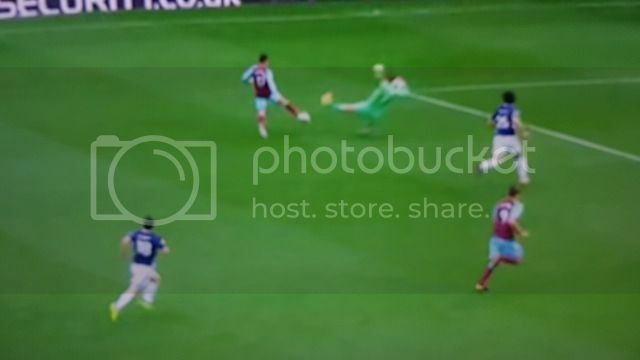 If that was an outfield player going in that high from so far away it would have been red 100% but because it's a GK the ref only gives yellow! Felt this at the time and still do. It's not this one decision - it's the feeling that we 'lose' the marginals so often. Being able to find that much space in a Pulis bank of defenders is what you pay 140 nicker a week for. Using the Slav rule of thumb, your Auntie Mavis figured out at the weekend that despite his energy, playing him wide takes most of his particular skills out of the game for no obvious benefit, so the countdown clock has begun - we just have to wait until mid-November for Slav to get there too. If Arautovic/Collins/Noble had done something like that, would they have been off..? Irrespective, we managed to get a point out of the game which supports the formation being used I think, and against less defensive-minded opposition we may have had more luck in attack. Anyone still in favour of 4 at the back? Or do we need to be adapting to the opposition...? I'm guessing neither of you actually watched the game then? I watched in the away end behind the goal directly in line with the infringement, about 15-20 ft higher, I have no idea where RARS was standing, where were you stood? I'm not saying I haven't seen them given incorrectly on other occasions, didn't make those decisions right either. give credit were credit is due x2 clean sheet is great for us and well done. If someone had said to me at the beginning of the week we would win Monday night 2-0 and 0-0 on Sat at WBA I would of took it all day long. Could there be improvements? of course, massively as there is always room to improve but its been a good week. x2 clean sheets will only give confidence to Hart & co so onwards & upwards to Sat which will be completely different opposition against a top spurs team and be a real test of us as a team and Slav's tactical knowledge. We were massively better on the ball and at keeping the ball here than we were against Huddersfield. Noticably so. Completely kept it away from Albion at periods through the game and were much sharper with passing than on Monday. Just lacked that little bit of something in the final third - was screaming at Antonio when he didn't make that pass to Hernandez. We really need someone who can pick those passes in behind the front two. I did think that Hernandez was a lot closer to Carroll this time than on Monday, still playing all over the opposition half and swapping around with Antonio but we were almost playing a 1-1-1 kind of formation amongst the three of Antonio, Hernandez, and Carroll. Good on Bilic for trying to change the game when Collins came off, too. Would have been all too easy to bring Ogbonna (or Rice) on for him but instead he stuck Arnautovic on to try and change our attacking game. Fonte MotM for me. Didn't give them a sniff all game. You say that, but I've found Lanzini guilty of the same thing. I remember vividly him taking a shot against Spurs in the 1st half when he should have laid it on a plate for Calleri in the middle. In the hear of the moment, sometimes players get carried away with themselves and I can understand it. You do hope they see the right choice more often than not though, regardless of if it's Antonio or Lanzinis of the world. Happens too often though, then I can imagine Hernandez losing his **** in the dressing room and rightly so when it's the kind of service he thrives off. Because he will more often than not slot them away. Then surely it's a red, then? Luiz was a stone wall sending off. I think what's confused the pundits is the fact it's a Goalkeeper that's making the tackle and in by doing So, they're default reaction is to take into account whether there's a last man covering, rather than concentrating solely on whether it was a reckless challenge or not wherever it took place on the pitch. Last edited by Colours never run on Mon Sep 18, 2017 10:26 am, edited 1 time in total. Obiang look a lot fresher than previous weeks, just needs to find his range now as his passing was WAY off on Saturday. Big Mic does get a little excited when he has space anywhere within 30 years of goal and tends to shoot always. I think he will learn that now Hernandez is here that there is always going to be someone in a better position, Carroll never moved into the spaces like Hernandez so a few more games together think we'll see a difference, add Lanzini in to be playing them balls through we're quid's in. The best thing about Hernandez is he will always make those movements whether the ball comes or not so as soon as we are up to speed with him we will be playing more to his strengths. I remember when we first signed Di Canio, he was on a totally different wave length to everyone else but when the players learned what he was about that started to play to his strengths which I hope is what will happen with Hernandez. Luiz was two Yellows , lads , he'd already been booked for his overhead kick attempt [ which I thought was harsh ] . Hammer.CA wrote: I watched in the away end behind the goal directly in line with the infringement, about 15-20 ft higher, I have no idea where RARS was standing, where were you stood? In my lounge for this game. So you're still saying it wasn't a red? The Old Man of Storr wrote: Luiz was two Yellows , lads , he'd already been booked for his overhead kick attempt [ which I thought was harsh ] . Luiz got a straight red for his tackle. He'd been booked but it was irrelevant. He received a yellow prior but the tackle was a straight red card (or I don't remember the Ref brandishing a yellow before the red unless I missed It?). The first picture shows Hernandez with the ball on his foot, the middle picture shows a fraction before contact, Foster studs up and a foot off the ground and the last picture show after contact with Hernandez, with the ball pushed passed him and his foot is still off the ground. Which bit of that is not a wreckless challenge?